Brazilian Environment Minister Izabella Teixeira has said the country's three most populous states are experiencing their worst drought since 1930. The states of Sao Paulo, Rio de Janeiro and Minas Gerais must save water, she said after an emergency meeting in the capital Brasilia. Ms Teixeira described the water crisis as "delicate" and "worrying". Industry and agriculture are expected to be affected, further damaging Brazil's troubled economy. The drought is also having an impact on energy supplies, with reduced generation from hydroelectric dams. The BBC's Julia Carneiro in Rio de Janeiro says Brazil is supposed to be in the middle of its rainy season but there has been scant rainfall in the south-east and the drought shows no sign of abating. The crisis comes at a time of high demand for energy, with soaring temperatures in the summer months. "Since records for Brazil's south-eastern region began 84 years ago, we have never seen such a delicate and worrying situation," said Ms Teixeira. Her comments came at the end of a meeting with five other ministers at the presidential palace in Brasilia to discuss the drought. The crisis began in Sao Paulo, where hundreds of thousands of residents have been affected by frequent cuts in water supplies, our correspondent says. The city's Cantareira reservoir system, which serves over eight million people, has now dropped to 5.2% of its capacity despite recent rain, Brazil's TV Globo reported. Accumulated rainfall in the area of Cantareira is said to be only 33.5% of that predicted for the month, Globo's G1 news site added. 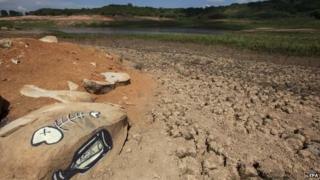 Sao Paulo state suffered similar serious drought problems last year. Governor Geraldo Alckmin has taken several measures, such as raising charges for high consumption levels, offering discounts to those who reduce use, and limiting the amounts captured by industries and agriculture from rivers. But critics blame poor planning and politics for the worsening situation. Political opponents say the state authorities failed to respond quickly enough to the crisis because Mr Alckmin did not want to alarm people as he was seeking re-election in October 2014, allegations he disputes. In Rio de Janeiro state, the main water reservoir has dropped to level zero for the first time since it was built. Environment Secretary Andre Correa acknowledged that the state was experiencing "the worst water crisis in its history". But he said there was enough water in other reservoirs to avoid rationing in Rio de Janeiro for at least another six months. Mr Correa described the situation in Sao Paulo as "infinitely worse". However, Rio and Minas Gerais are asking residents and industries to reduce water consumption by as much as 30%.